by mixing Liquiblack with gray cement. Note: Colors shown are approximate and may vary slightly with local cement and aggregates. One pint is generally considered one pound. Ask us about our bulk dispensing systems! Call for a free consultation. Concrete Chemicals transforms carbon black, an intensely black powder, into an easy-to-use black liquid. The trade name for Concrete Chemicals� liquid carbon black is �Liquiblack.� An aqueous dispersion, Liquiblack is used to color curbs, gutters, gas station pads, garden statuary, stepping stones, and swimming pools. If it is cement, and you wish to color it gray or black or any shade in between, Liquiblack is the fast, clean, easy solution. Liquiblack is an organic colorant widely used by Ready-Mix concrete plants. 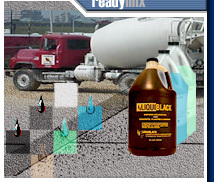 Liquiblack is dispensed directly into the truckload of concrete and delivered to the job site. For smaller jobs, contractors can purchase gallons of Liquiblack and pour the colorant directly into portable mixers. For even smaller jobs, the do-it-your-selfer can pour smaller amounts of Liquiblack into hand-mixing pails, adding just enough colorant to achieve the desired shade of gray or black. Liquiblack can be purchased in bulk and dispensed from a 500 gallon tank, purchased by the pallet load of 48 cases of gallons (192 gallons to the pallet), or in smaller numbers of cases, or single bottles. Whatever the need, Liquiblack is ready to give you the shade of black your job requires. Liquiblack, the carbon black colorant, is available through many suppliers throughout the United States and Canada. Please refer to COLOR SUPPLIERS above. Warnings: Do not freeze Liquiblack. Liquiblack reduces the effect of air entrained admixtures. Liquiblack coagulates in direct contact with Calcium Chloride. If Calcium Chloride must be used, thoroughly mix Liquiblack in mix first. Guidelines for optimum Uniformity of Concrete Color when using liquid colors. Concrete Chemicals has researched common causes of the dark spots or blotching which appears in concrete slabs containing concrete colors. Finishing. Improper finishing technique of colored concrete is the number 1 cause of dark spots or blotchy appearance of the surface of a concrete slab. Specifically, discoloration will almost certainly occur with late or hard troweling. Troweling should begin after bleed water is gone and be completed while the concrete is still plastic yet stiff. Some finishers might apply water to a surface to aid late troweling which only makes blotchiness worse. This also applies to brooming although dark spots are less likely with brooming than troweling. Curing. Not following the correct curing procedures for colored concrete is the second most likely cause of blotchy concrete. The surface should not be allowed to dry for at least 5 days. This should be accomplished with a curing agent. Using plastic sheets, saw dust, sand or applying water can cause blotchiness. Calcium chloride will darken any cementitious material so the use of calcium chloride may result in a darker color than desired. In some cases it may also increase mottling. We have found no evidence of incompatibility between calcium chloride and pigments with the exception of Liquiblack coagulating. Calcium chloride should be limited to 2% and if used with Liquiblack, thoroughly mix the Liquiblack in the batch then add calcium chloride, longer than normal mixing time may be needed to overcome any coagulation. 1) Optimum slump for any pigmented concrete is 4 to 5 inches. Don't allow drivers to add water at the job site as each driver will add a different amount resulting in a different shade of color. If more than a 5 inch slump is required, use a water reducer. 2) Add concrete color to the mix at the same point in time during the batching process. 3) Mixing time should be consistent. This includes mixing time and mixing speed in the ready mix truck... discourage drivers from stopping for donuts on the way to the job site! 4) Be sure that the ratio of the individual components of the concrete (water, cement, aggregate) is the same. Also, don't use different lots of cement, sand, gravel, etc. unless you're sure they're identical. 5) The subgrade must be uniformly graded, compacted, and thoroughly moistened. Slab thickness should be uniform. In conclusion, problems with colored concrete might be an indicator of concrete quality (or lack of). Properly finished concrete and careful adherence to a few rules should give consistently good results. Check our Color Suppliers page for the location nearest you. Being in business since 1957 has been our good fortune because of all our valued customers. Thank you. We invite you to contact us for more information --- toll free at 888-867-5701 or email us.